If you've been having trouble keeping your seed dry during this impossibly hot and humid summer in mid-Michigan, remember Wild Birds Unlimited has Feeder Fresh. I usually use it only in the rainy spring and fall but because of the liquid heat we've been experiencing I've had to use it all summer. Feeder Fresh is added to the seed when you fill a feeder. It absorbs water and humidity, is safe for birds, and made from non-toxic absorbent sand. Feeder Fresh keeps the seed and feeder dry, keeps molds from forming, which reduces the chance of Aflatoxin and other mycotoxins. Once the Feeder Fresh absorbs its own weight in water it will discontinue absorbing, and be identical to the silica grit that birds normally ingest. To use: Start with a clean feeder, and pour a couple teaspoons of Feeder Fresh into a scoop of seed and fill your feeder. Repeat as needed each time you fill or maintain your feeder. Use more during high humidity and rain or less as the weather drys and cools. I had a feeder with some "trouble spots" that kept clumping up. I was tired of a dirty ugly feeder with NO BIRDS! 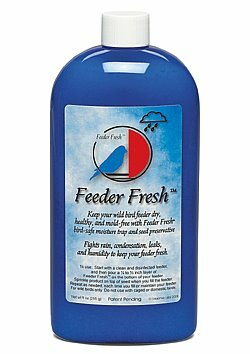 I now use Feeder Fresh and I am so glad someone finally came up with something that does not use chemicals to clean my feeder. That can't be good, or bleach like I see on most how-to's. I Love Feeder Fresh, and now I have more birds than ever visiting my yard. !